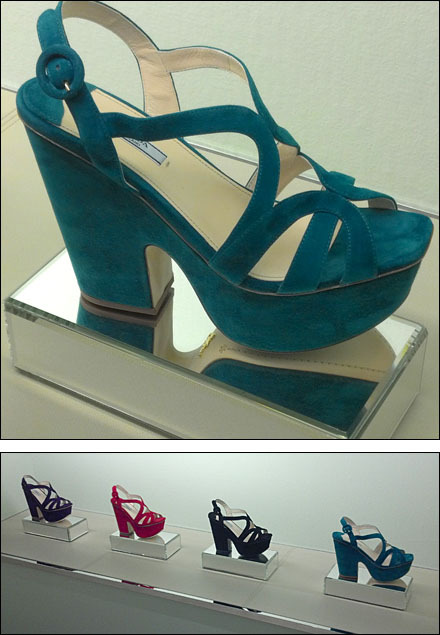 Another minimalist display that features a mirrored Plinth and the range of shoe colors available. Not only can a color series be eye-catching, but can increase sales, at least if you are a self-admitted “Shoe Whore” like my wife. She is known to buy a shoe she loves (and is comfortable) in several colors to go with several looks. Would the prices of a Prada deter her? Not if I didn’t intervene. Me? When it comes to price, I’m a Payless fan. If you are talking design, then yeah, I guess Prada has an edge.